Narrow-Leaved Swertia is an annual herb, 20-80 cm tall. Roots are yellow, fibrous. 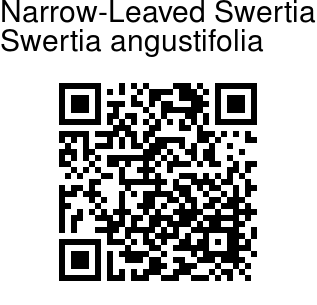 Stems are erect, subquadrangular, narrowly winged on angles, branched. Leaves are stalkless, lanceshaped to elliptic-lanceshaped, 2-6 cm × 3-12 mm, both ends flat, veins 1-3. Inflorescences panicles of cymes, spreading branched, many flowered. Flowers are 4-merous. Pedicel erect, 3-7 mm. Calyx tube 1-2 mm, sepals linear-lanceolate, 6-8 mm, apex acute, midvein 1-3. 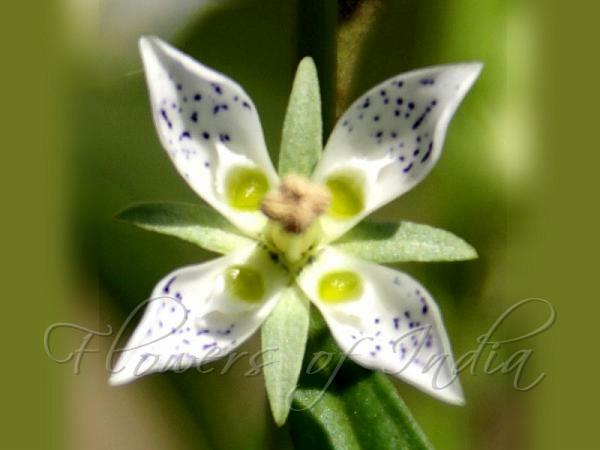 Flowers are white or pale yellow, with brown spots, 8-9 mm in diameter, tube 1-2 mm. Petals are 4-6.5 mm, tip blunt and apiculate. Nectaries 1 per corolla lobe, pocket-shaped, with an orbicular scale and many minutely hairy short fimbriae at apex of pocket. Filaments 3.5-4 mm; anthers ellipsoid, ca. 1 mm. Style short, distinct; stigma lobes capitate. Capsules ovoid, 5-7 mm. Seeds are brown, ellipsoid, about 0.6 mm. Flowering: August-November.